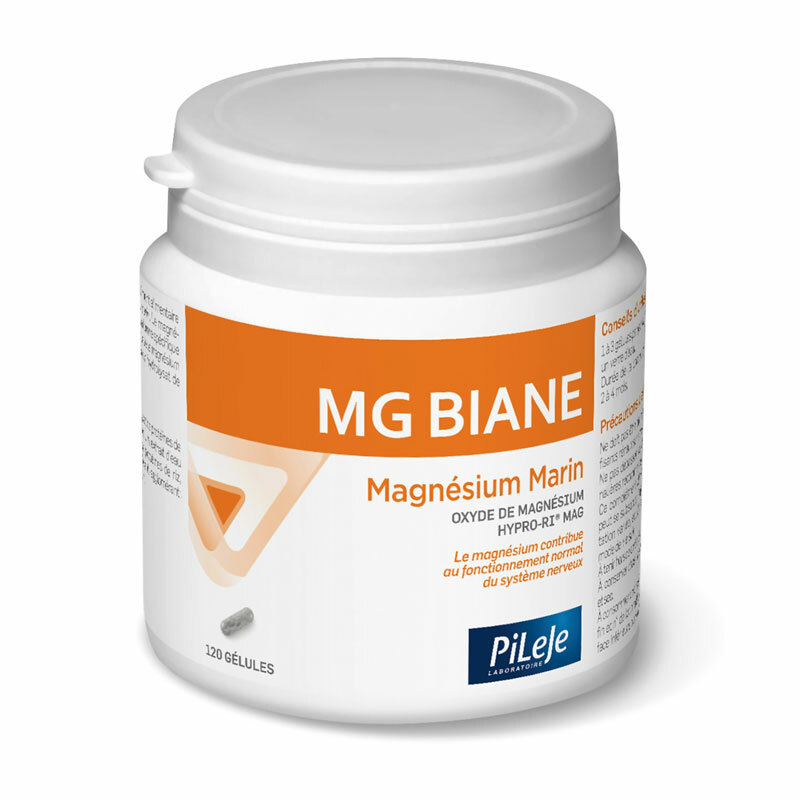 PILEJE BIANE MG 120 CAPSULES: An adequate dietary intake of magnesium is a balancing factor. When we lack magnesium, we are subject to a difficult sleep, fatigue, anxiety, indigestion, cramps ... Because magnesium helps the proper functioning of our brain, our muscles, our vessels and our heart. Magnesium is found naturally in plant products such as cereals, potatoes and vegetables, and we need 300 mg daily and these needs are higher in adolescents during pregnancy and in sports. Its relaxing properties of nerve and muscle function of the mineral magnesium are preferably to prevent states of stress or anxiety and their effects: feeling of exhaustion, fatigue on exertion or "strokes". 1 capsule of 102 mg Mg Biane provides magnesium is 306 mg for 3 capsules. Mg Biane allows dietary intake of magnesium satisfactory bearing potential deficits. Take 1 to 3 capsules per day for 2-4 months. Hydrolysed rice protein, magnesium oxide extracted from seawater, vegetable capsule (dye: titanium dioxide), anti-caking agent: magnesium stearate. With 102 mg of magnesium per capsule, 33% RDA *, Mg Biane Pileje helps offset imbalances in the contemporary diet often too low in magnesium. * RDA: Recommended Daily Allowance of Directive 90/496/EEC. 7 out of 10 French have magnesium intakes below the Recommended Dietary Allowances. Do not take Mg-Biane in renal failure.